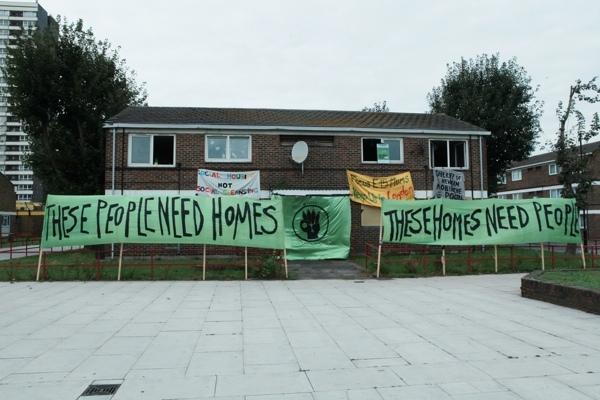 No-one could fail to respect the courage shown recently by the young mothers of Stratford who, after eviction from the E15 Focus hostel, took possession of a pair of vacant council houses on the Carpenter’s Estate next to the former Olympic site. So last week Contributing Photographer Colin O’Brien & I went over to meet two of the protagonists – close friends Sam Middleton & Jasmine Stone – and hear their story in their own words. Their audacious gesture ignited a flashpoint in current social policy, both in this Olympic borough and nationwide, as councils seek to balance the books by selling off housing stock to those wishing to exploit the commercial potential of these assets upon the open market. The outcome is a shortage of accommodation and, in this equation, developers’ profits come at the human cost of those most in need of a place to live. “The athletes’ village was supposed to become social housing, but then they swapped that idea for ‘affordable’ housing, which is 80% of the market rate,” added Jasmine with a wry grin. The distinguishing quality of this pair is that, although they have found themselves on the rough end of policy, they have stubbornly refused to become of victims of the circumstance. 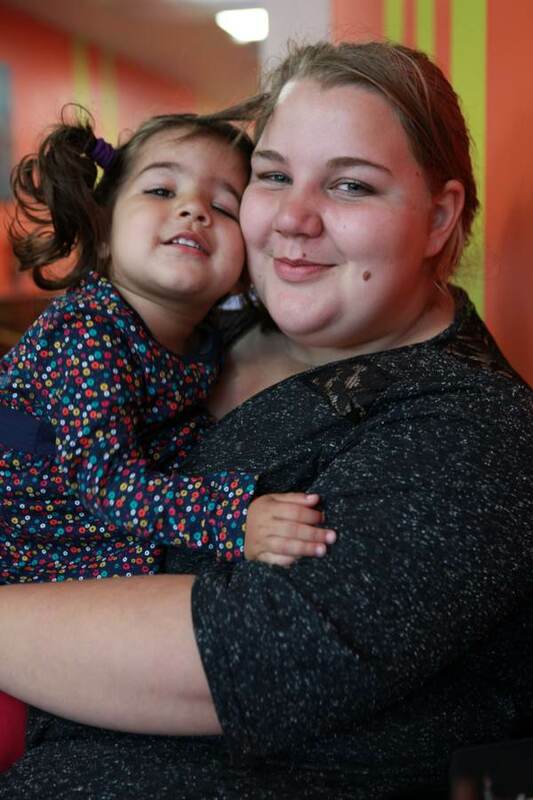 The two young mothers have forged a bond of friendship, acquiring a confident political awareness and articulacy that is startling to encounter.“We met at the hostel and we’ve been best friends ever since. I think we could easily win the three-legged race,” Jasmine assured me. 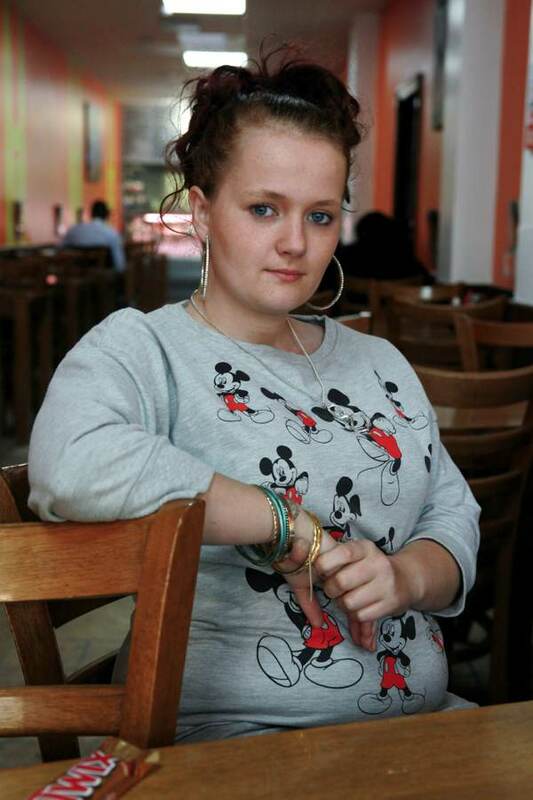 Looking beyond her own situation, Jasmine explained to me that one hundred and eighty vulnerable young people were evicted from the E15 hostel without any support and four who are known to her are now living on the street. Meanwhile, Newham Council has four hundred vacant council homes including three almost unoccupied tower blocks on the Carpenter’s Estate in the centre of Stratford. Many have been boarded up for years with the upper windows open to accelerate decay. She believes that the council were awaiting the opportunity to sell the estate to a developer to build luxury flats while local people are deprived of homes. “It’s the gentrification of London,” she confided to me. The fortnight’s occupation of two of these houses by a group of the young mothers, which is now over, was a protest against the injustice of this state of affairs that succeeded in winning widespread public support. As we were talking, Jasmine received a phone call with the unexpected news that the council is now refurbishing forty houses on the Carpenter’s Estate to open up for the use of those in need. It was a cathartic moment for the pair and a validation of their protest which brought this about. “If they’re opening up forty houses, they can open up the rest of them,” she exclaimed in joy, exchanging a triumphant smile with Sam. Good for them! Shelter — decent housing — should be a basic human right. Yes, I never quite understood when it was exactly when society decided that the world can look the other way when regular plain people had to move out on the street to become homeless. How is it that politicians cannot look the other way to fight religious wars halfway around the world when our own people are living homeless under freeway overpasses? I still don’t get it… especially considering how much those wars cost and who they’re trying to protect. Look the other way… look the other way… look the other way. Well done for highlighting this important campaign. These women are a tonic to read about on this dull wet Monday morning. All strength to them and I hope they are listened to. An inspiring story and one which continues to highlight the “gentrification of London”. A city that is rapidly becoming unaffordable to all but the wealthy. Areas that were once predominantly working class communities are now populated by faceless professionals and city types who are prepared to pay the ludicrous seven figure fees for small terraced houses. A sad reflection on what London is becoming. Well done, well done, well done, well done. What brilliant people you are. And council decision makers are too far away from the people they are to supposed to serve. Well done for getting in front of their faces. Well done for giving this some more publicity. There is precious little opposition to heartless policies which are seriously damaging peoples’ lives. 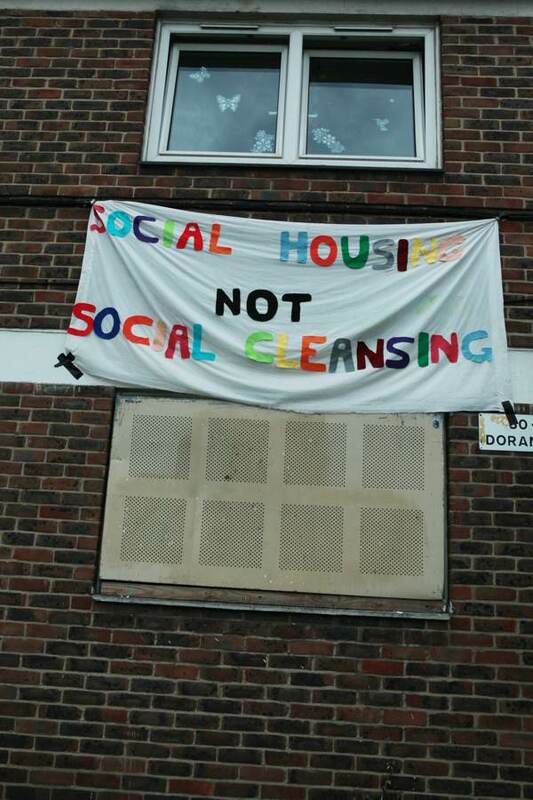 Shame on a heartless government that would have old-fashioned one nation Tories turning in their graves and shame on Newham Council for meekly accepting the profit motive over people. 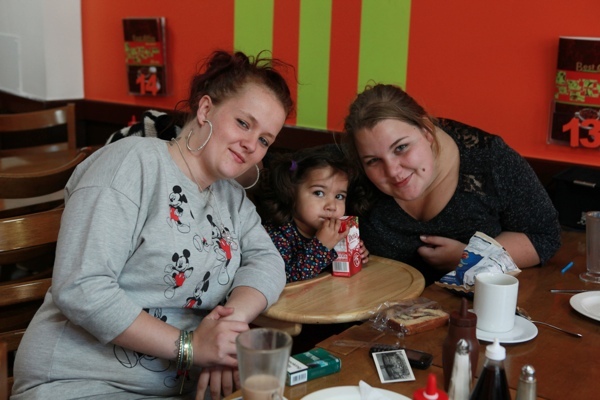 These young women are an aspect of “Spitalfields Life” that warrants recording. I agree that they have a right to decent living space. I applaud their determination in taking over decent living space that stands vacant in the neighbourhood in which they were reared. But I wonder at the assumption that they have a right to live where they were reared. They want to live where they were bred. Where they were bred, however, exists no longer. London has changed beneath them. Take as an axiom, yes, that humans have a right to shelter — and that the rich must pay to let the poor be housed warm and dry and safe. But must the rich pay to let the poor be housed in a sort of Museum of London 1960, “as it was and where it was”, re-creating conditions when these women’s grandparents came into the world? That is an odd romanticisation of those conditions, it seems to me. It is as if one approved of establishing in an enclave of subsidy a sort of human zoo with, over this particular enclosure, a placard reading “The Lower Classes”. “With the money that we have,” says the council, “we can pay for ten families to be housed in Margate or three families to be housed in London.” Margate it is, then. And the ratepayers should applaud. Thank you for this inspiring piece and these inspiring people. To Margate and UKIP, wondercat? Push people around, push them out and in this case push to the end of the line where jobs and opportunities are scarce and the locals tired of their town being used as an overspill of London’s “problems”. Applaud away all you like but you miss the point. People with means have the choice to live where they were “bred” but you argue that this is a romantic notion where the poor are concerned. I see your logic but it is this sort of thinking that in the end creates extreme political views. Yes, it’s amazing the lengths that greedy ‘investors’ will go to. A healthy society needs a mix of people living together in one area, rich and not so rich close together rather than shipped out to fill vacant sites. The rise of the white middle class ghetto is very disturbing and only helps to divide people against others. wondercat: if making a ‘museum of London 1960′ means returning to a time when we wanted to make this country – and this city – a better place for every citizen to live in, not just the rich, then I’m all for it. It’s a whole lot better than returning to the pre-1930s, with most of the East End owned by rack-rent landlords, no rights for tenants, and a majority of the population unable to even think of affording their own home. Three cheers for the Stratford mums. Hi there, could I have Jasmine Stone’s address and telephone number?